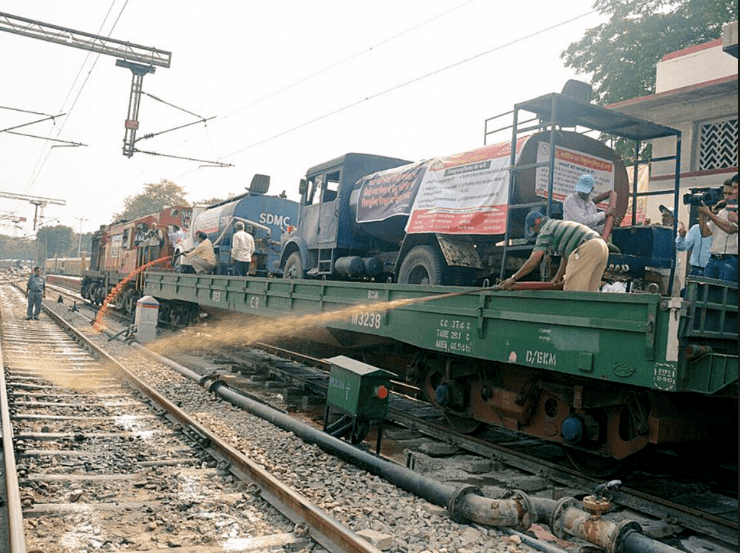 Mosquito Terminator on Wheels, a special mosquito terminator train has been jointly launched by Delhi division of Northern Railway and South Delhi Municipal Corporation (SDMC) to prevent mosquito breeding along railway tracks in New Delhi. It aims to control and mitigate menace of mosquito breeding in the burrow pits along railway tracks in New Delhi. For this train, SDMC has provided high power sprayer and insecticide on truck mounted power sprayer. It has been loaded on special kind of wagon, which will spray insecticides during train movement. Himachal Pradesh Chief Minister Jai Ram Thakur launched ‘horn not ok’ awareness campaign and ‘shaur nahin’ (no noise) mobile application in state capital Shimla. The campaign aims to spread awareness of unnecessary blowing horn as it creates unnecessary noise pollution and is harmful to health. The first phase of campaign has been launched in Shimla and Manali. The mobile application that enables general public to report cases on noise pollution is an initiative of department of environment science and technology in association with National Informatics Centre (NIC), Himachal Pradesh. Researchers from China’s Centre for Excellence in Molecular Plant Sciences have claimed to have created the world’s first single-chromosome yeast while not affecting the majority of its functions. The experiment was conducted on Brewer’s yeast having 16 chromosomes and which shares its one-third genome ancestry with humans. Researchers were able to fit nearly all genetic material of Brewer’s yeast into just one chromosome. To help young people build skills they need to safely enjoy online technology, social networking giant Facebook has launched “Digital Literacy Library”. The lessons can be found on Facebook’s Safety Center as well as on Berkman Klein’s Digital Literacy Resource Platform. There are 18 interactive lessons and videos have been developed in partnership with Youth and Media team at Berkman Klein Center for Internet and Society at Harvard University for educators of youth aged 11 to 18. These lessons are divided into themes such as privacy and reputation, identity exploration, security, safety and well-being and can be downloaded for free. Union Government has announced that it has reached target of providing 5crore free LPG connections under Pradhan Mantri Ujjwala Yojana (PMUY) almost eight months ahead of schedule (i.e. in 27 months instead of 35 months). Union Government launched PMUY in May, 2016 with tagline of Swachh Indhan, Behtar Jeevan. It aims at providing clean-cooking fuel to poor households, who are otherwise vulnerable to various health hazards associated with indoor air pollution and bringing in qualitative charges in living standards. Telangana State Information Technology, Electronics and Communication department (ITE&C) and Tech Mahindra signed Memorandum of Understanding (MoU) to launch India’s first Blockchain district. The MoU was signed at International Blockchain Congress 2018 held in Hyderabad. Block chain district will be centre of excellence, incubator and process development for emerging technology with innovative infrastructure and facilities to foster growth of Indian blockchain start-ups and companies. India was elected as President of the Asia-Pacific Institute for Broadcasting Development (AIBD) for period of two years at 44th annual gathering of AIBD held in Colombo, Sri Lanka. Director General of All India Radio (AIR) F. Sheheryar was also re-elected as chair of executive board of AIBD while Sri Lanka was elected as vice-chair. Broadcasters from 26 countries in the region including India are full members of the organization. AIDB is regional inter-governmental organisation serving countries of United Nations Economic and Social Commission for Asia and the Pacific (UN-ESCAP) in field of electronic media development. It was established in 1977 under auspices of UNESCO. It is hosted by Government of Malaysia and its secretariat is located in Kuala Lumpur. Lok Sabha has passed National Sports University Bill, 2018 to set up the country’s first National Sports University in Imphal (west), Manipur that will provide sports education, research and coaching. The Bill replaces National Sports University Ordinance, 2018 promulgated by President in May 2018 to protect interests of students who already have been enrolled in National Sports University. The specialised university for sports will be first of its kind in the country and it will adopt best international practices. 2. In which year Pradhan Mantri Ujjwala Yojana (PMUY) was launched with tagline of Swachh Indhan, Behtar Jeevan? 3. Which among the following social networks has launched Digital Literacy Library? 4. Where is the India’s first Blockchain district going to be launched? 5. When was the Asia-Pacific Institute for Broadcasting Development (AIBD) established? 6. Who has been elected as President of the Asia-Pacific Institute for Broadcasting Development (AIBD) in 2018? 7. Where will be the first National Sports University established according to National Sports University Bill, 2018?